GENEVA, SWITZERLAND--(Marketwired - Jul 20, 2014) - In April, Michelle Obama planted the White House Kitchen Garden for the sixth year in a row and thanks to the sunny weather interspersed with frequent rain showers, the President should be lucky enough to have some home-grown fruit and vegetables on his plate by now. The first lady started her vegetable garden on the South Lawn in 2009 to spur a national discussion about healthy food in the United States. When she planted the crops for this year, Mrs. Obama invited a group of elementary school students to join and help her. With her vegetable garden and the Let's Move! initiative that evolved out of it, the President's wife wants to teach children, teenagers and adults across the country about the value of healthy food and strives to inspire them to grow their own fruit and vegetables. No matter if your garden is on the lawn of the White House or in the back of your town house, the secret to fruitful growing often lies in the quality of the fertilizers and pesticides that are being used. A market leader in this area that offers not only highly effective, but at the same time healthy, all-natural and sustainable products is Vegalab, a formulator and manufacturer of environmentally responsible agricultural products rooted in sustainability. 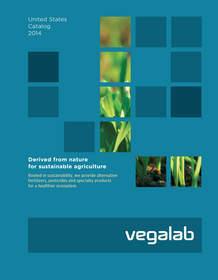 While Veglab has been used by professional farmers and gardeners for years, the company's portfolio also includes hobby gardeners who can benefit from the great advantages of the innovative, environmentally safe solutions developed in the cutting-edge laboratory in Geneva, where the company has its European headquarters, managed by David Selakovic. Only recently SUPREME GROWERS® was launched, a consumer gardening line with outstanding fertilizing properties that comes in small packaging which makes it perfect for gardeners that struggle with space restrictions. One thing that leisure and professional gardeners alike benefit from is Vegalab's outstanding customer service. David Selakovic puts the company's goal to optimize the world's resources in order to ensure an ecologically sound planet for future generations in the center of all business operations. As a result, Vegalab's customer relationship extends way beyond sales activities. Products are followed to the end farmer to explore how they are used, how effective they are, how they can improved and to be at the customers' disposal if any issues occur that need to be solved. And a designated development team actively obtains comments and suggestions from farmers to collect ideas for future improvements. David Selakovic is a well-versed business leader and entrepreneur with many years of experience in launching successful companies, building expert teams, and developing innovative business strategies for small to large corporations. Thanks to his outstanding international reputation, Selakovic has become highly sought-after corporate adviser with a passion for helping others to realize their business ideas. Selakovic lives with his wife Leah in Singapore. In his free time, he likes to explore his personal interests in photography, sailing, classical art and racing cars. On top of that he is actively supporting numerous charities that reflect his personal core values and allow him to give back to the local communities that helped contribute to and support his current successes.